Merci à vous tous pour votre soutien, je souffre dans mon âme, mais le courage et la détermination permettront de la remettre debout. My heart aches for the whole world's loss, but especially for the French citizens. This was a landmark in their Homeland and all of us internationally got to benefit from the French sharing this beautiful site with us. A very sad event currently,and still will be a sad day in history. It was a horrible way to end our day yesterday. My grieves for the people of France. Such a tragedy for all Christians. I am absolutely sure that the whole world grieves with Paris\France. I cried watching the videos and pictures..Even if rebuilt, it won't be the same...too terribly tragic. 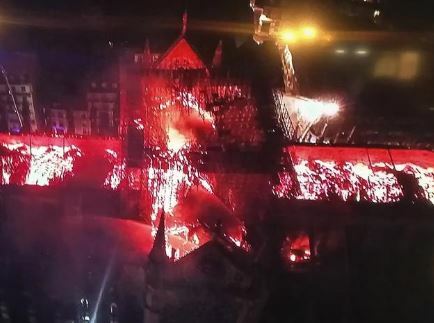 So sad to see the fire... What a tremendous loss of history, beauty, the art the church etc.... Hopefully it will rise from the ashes. Heard on news some billionaire promised a donation of 100mil to rebuild/repair damage. 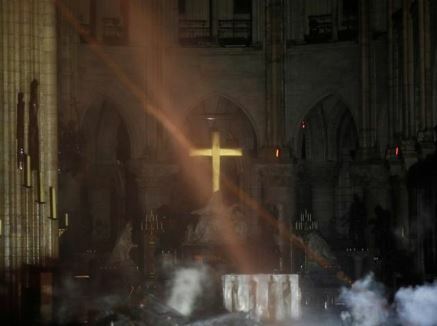 Believe the relics of crown of thorns, the Altar and Cross did not burn! 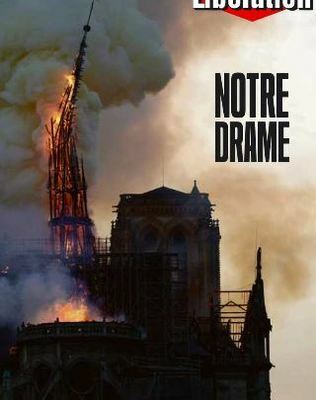 The fire of the Cathedral Notre Dame is great misfortune for France and the whole world. So very sad to watch the horrific fire. How strange to get an alert on my phone that Notre Dame Cathedral is burning - shocking and heart braking!! I'm praying that they get the fire out and that the damage is minimal, but from reports, I'm afraid it's not. I havea friend whose friends are visiting there and staying 1/2 mile from Notre Dame. They ran out when the sirens started going off and said that fire was raining down for at least 1/2 mile circumference. A lady next to her had her hair catch on fire. I think the ones in shock watching got their senses back about them and backed away. I hope no one is injured. Very sad indeed. I remember visiting one summer. It's heartbreaking to watch the flames raging in the wooden beams that form the roof construction. And so high up that the fire brigade can hardly make a difference. What will be left tomorrow? I am saddened by the loss as well. I think I remember this is a World Heritage Site and such a symbol for the French people. We're waking up in Australia to breaking news listening to the people who are there. We watched the tower collapse and heard there are about 400 firefighters. The loss of the historic artwork, not to mention the Cathedral itself is just heartbreaking. Such a huge loss for the world! I wanted to take my children "one day" but now, it will never be the same. The feelings one gets when inside a building with so much history cannot be rebuilt and be the same. Deep sorrow for all. Beautiful and historic. And spiritually inspiring.